Arrested for wearing saggy pants? (CNN) -- A passenger's refusal to pull up his saggy pants led to his arrest Wednesday aboard a US Airways flight at San Francisco International Airport, according to police. The passenger, Deshon Marman, was arrested and held for trespassing, battery and interfering with the duties of a police officer following an incident that started at the gate, when agents asked Marman to pull up his pants to cover his underwear, said San Francisco Police Sergeant Michael Rodriguez. Marman, 20, a football player at the University of New Mexico, was in San Francisco to attend the funeral of a close friend, the San Francisco Chronicle reported. Before and during boarding for US Airways Flight 488 to Phoenix, three US Airways employees asked Marman to pull up his pants, Rodriguez said. In response to the second request, "he said he didn't have to because he had purchased a ticket," Rodriguez said. US Airways spokeswoman Valerie Wunder said the airline does not have a specific dress code, "but we ask our passengers to dress in an appropriate manner to ensure the safety and comfort of all our passengers." Deshon Marman was arrested Wednesday after a dispute aboard a US Airways flight. After repeated refusals from Marman to pull up his pants, the crew alerted the airliner's captain to the disruption and police were called in to assist, Rodriguez said. Wunder referred questions about details of the incident to police but said it is her understanding that the incident began with Marman's attire but escalated when "he repeatedly ignored crewmember instructions." The captain made a citizens arrest of Marman for trespassing when he refused to leave the plane, according to Rodriguez. The captain decided to deplane the other passengers when Marman would not immediately leave the aircraft, Rodriguez said. After leaving the plane, Marman resisted being handcuffed in the jetway, Rodriguez said, injuring an officer in the scuffle. Marman's mother, Donna Doyle, told the San Francisco Chronicle that her son was distressed after attending the funeral for his friend and former teammate. 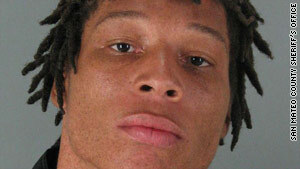 San Mateo County officials said Marman will be arraigned on Friday. CNN's Eliott McLaughlin contributed to this report.